An Auckland Council Exhibition Series at Community Art Centres in 2012-2013 featuring emerging curators working with leading, established and emerging artists. Dr. Tina Engel Schwarzpaul, a professor of Spatial Design at AUT, observes that the traditional metaphor for space as an empty container fails to account for the social dynamics of space. Samoan culture has a definition for this dynamic however, with the concept of vā which was first defined in 1911 in Pratt’s Grammar and Dictionary of the Samoan Language as “a space between”. In modern common usage, vā refers to the relational space between two places, things or people. Drawing loosely on the notion of vā, this exhibition seeks to highlight the role of space in negotiating and contextualising the relationship between disparate entities. A Space Between brings together three local, contemporary photographers who investigate the social function[ii] of interior spaces. 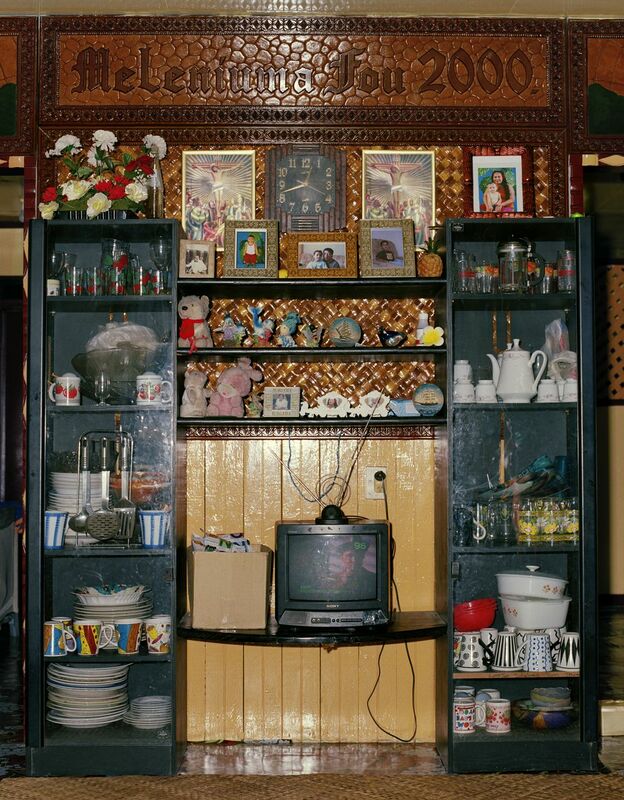 The exhibition takes its starting point in Samoa, where photographer, Edith Amituanai, applies an anthropological eye to the interiors of Samoan homes. In departure from the traditional homes remembered by a generation of first-wave immigrants, these interiors are brim with imported objects, reflecting the contemporary context of material exchange. Masina (2008) notably depicts a room divided by an oriental wall unit while Millennial (2008) centres on a television broadcasting an American cowboy western movie. Interiors are thus presented as restless sites of redefinition between one generation and the next. Back in Auckland, the work of artists, Caryline Boreham, and, Amanda A’Hara, bring the terrain of the exhibition back to more familiar visions of New Zealand. Caryline Boreham’s photographs examine the largely undocumented and inaccessible interiors of prisons. 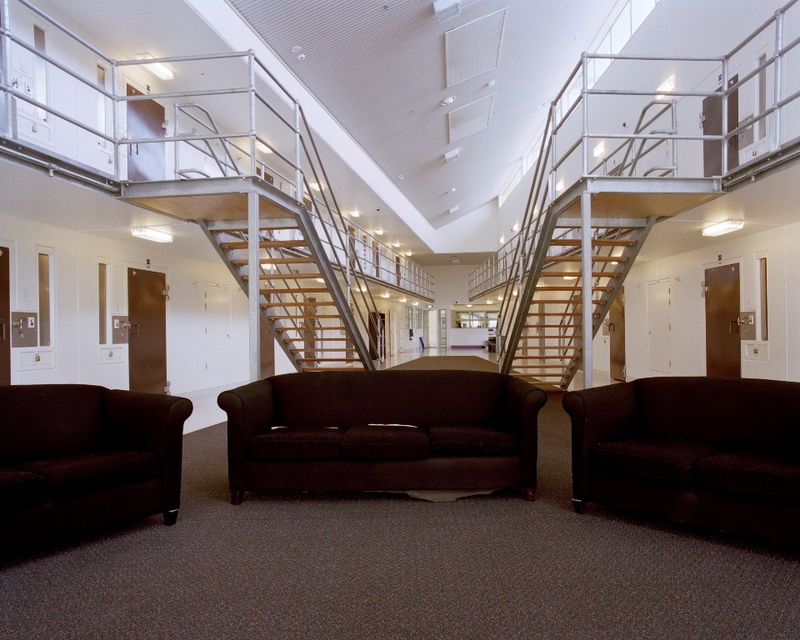 Devoid of human presence, Boreham’s photographs draw attention to the architectural space of prisons rather than the people who inhabit them, provoking stark yet pensive reflections on the role of prison interiors in regulating the movement of people. The school setting is the focus of Amanda A’Hara’s images. Archetypal scenes of empty school interiors are presented to the viewer; a school hall with rows of chairs before a curtained stage; misshapen coat hangers against the teal paint of the changing room. Seemingly frozen in time, these images evoke our own memories of similar spaces, crafting a sense of a shared collective history. While the spaces chosen by these three artists differ in geography and function, each presents interiors that are innately inscribed with woven connections. Together, these photographs explore the influence of space on social relations, complicating the notion of space as simply “an empty container waiting to be filled”. A Space Between is showing at Kumeu Arts Centre 17-29 September 2012. A Space Between is the second exhibition in the Archipelago series, comprising four exhibitions by emerging curators, each relating to our sense of place, that will be happening at art centres across north Auckland between July 2012 and February 2013. The series is an initiative to take new contemporary art to the diverse, ‘archipelagic’ group of communities that is north Auckland. The series has been initiated and developed by Auckland Council’s Arts and Culture North department. [i] Engel Schwarzpaul, Tina, Restless containers: Thinking interiority – across cultures, Interstices: Journal of Architecture and Related Arts (12), 2011. pp17. [ii] Sa’iliemanu Lilomaiava-Doktor, Beyond “Migration”: Samoan population movement (Malaga) and the geography of social space (Va), The Contemporary Pacific (21), 2009. pp12. This entry was posted on September 12, 2012 by mattblomeley.